Biofreeze is a topical Pain Reliever used in pain management to treat athletic injuries, sports injuries, sore muscle, strained muscles, shoulder, arm, neck, hip, knee, foot, leg, joint pain and back pain. Boifreeze also relieves pain associated with arthritis, tendonitis, diabetic neuropathy, and bursitis. Biofreeze Pain Reliever contains ilex, an all-natural, herb that has been used for centuries by the Paraguay Indians to enhance their medicines. Used by therapist to treat stiffness and to increase range of motion, Biofreeze can be before, during and after treatments. 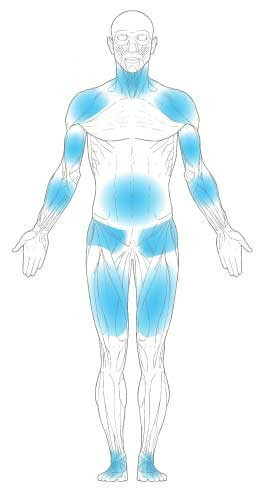 During treatment patients experience less stiffness enabling greater range of motion and flexibility. Penetrates skin quickly and deeply. Greaseless and non-staining with a vanishing scent. Cold Therapy with easy application. 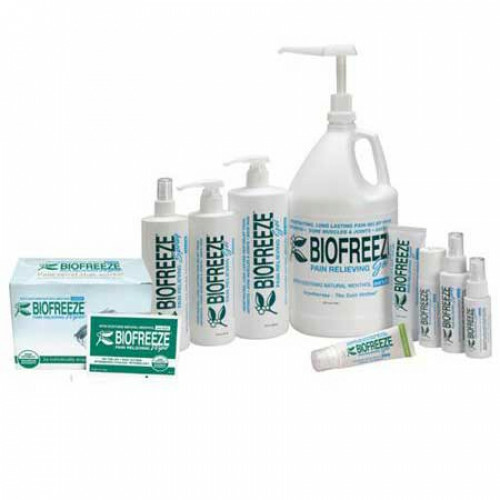 Biofreeze Pain Reliever comes in several different options to meet individual needs. Options include Biofreeze Gel, Biofreeze Roll-On, Biofreeze Spray, Biofreeze Wipes, and Biofreeze Tube. Below is a more detailed description of each Biofreeze option. Biofreeze Roll-On provides for Biofreeze application without the need to use your hands. The easy to use Roll-On application provides a massage for soft tissue wherever you apply product and can be used in trigger point therapy. Biofreeze Pain Relieving Roll-On product number is 110. Biofreeze Spray uses menthol as an active ingredient. Reformulated in 2009, the Biofreeze Spray formula also has the inactive ingredients Ilex, MSM and a new blend of botanical ingredients including Arnica, Calendula, Chamomile, Echinacea, Juniper Berry, and White Tea. The Biofreeze Pain Relieving Spray is paraben free and dye free. 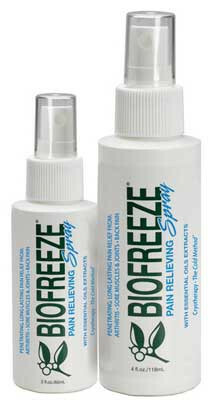 The Biofreeze Spray formula provides improved performance and longer-lasting pain relief. The spray application provides access for those hard-to reach areas, such as the middle back and lower extremities. Biofreeze Gel is dispensed from a tube and is applied to the area with pain by massaging the affected area during application. Hands-on application of the Biofreeze Pain Relieving Gel reinforces touch which has been shown to be very important in the healing cycle. 4 application options to meet individual needs: Biofreeze Spray, Biofreeze Gel, Biofreeze Wipes, Biofreeze Roll-On..
Botanical ingredients including Arnica, Calendula, Chamomile, Echinacea, Juniper Berry, and White Tea. Is the active ingredient menthol or lidocaine? The active ingredient is menthol according to the manufacturer. Can I put bio freeze on my knee if I have a metal plate in my knee? We do not employ any medical professionals and therefore cannot answer any specific questions regarding this item. We recommend contacting a medical professional or the manufacturer for the most accurate information. I am a long time user of the 4oz tube of gel. I was introduced to Biofreeze by a therapist at a rehab clinic. It is a great pain reliever for sore muscles and joints. The smell is is not overwhelming like some other products.